Okay, so I'm still on a bit of a "Keep It Simple" kick...but really, at this time of year shouldn't we all be slowing down? 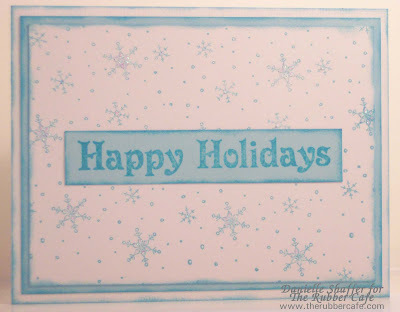 For this holiday card, I first embossed my Happy Holidays 2 sentiment in White on White cardstock. Then, I random stamped my background using It's A Blizzard Outside in a light blue ink. Super easy and super fun. I hope that your Christmas was a happy one, and that your New Year's Celebration is safe and relaxing. It's a late Tuesday night here and I've spent the day doing inventory, taking care of my sick husband and playing with the dog. I'm just a little late with the post. I really enjoyed making this card. The layout on the front is a little plain...but the inside is so cute I didn't want to distract you with details. This is a new set that isn't on the site for sale yet...but if you shoot Melissa an email at The Rubber Café...I'm sure she'll take good care of you. This is an A2 card scored at 3 ½" 4 ¼" & 5". The outside of the card is just scored at 4 ¼". I then placed acetate strips, approximately ½" wide x 3" long, staggering from left to right so that when the card opens each goes a different way. I layered the acetate between strips of cardstock and punched the sayings using a word punch. I just used a little heart punch and stamped it with the same dots I stamped out for the border on the front of the card. Hi folks! I hope you’ve had a magical Holiday and that you all have some nice plans for the upcoming New Years Eve. I’ve had my house full this past week, but I’ve also managed to sneak in some crafting time. One good way is to involve the guests… You’ll see what I mean further down this post. First I have a couple of cards to share. I’ve made 10 out of this first design, and we will use it for invitation to my son’s Christmas Tree Party next weekend. It involved quite some cutting, but the design is simple so it was kind of easy. My son choose the stamps himself and he is really pleased with how it turned out. The stamps used are Gingerbread Background and Winter Fun Labrador and Kitty Set. I love this set, they are so cute, and I’ve found myself using it over and over again. The second card is a celebration of the beautiful and fun snow! We’ve got plenty around here the last week, and we’ve had so much fun in it! On this one I’ve used the Baby it’s cold outside set. I stamped the snowman twice. First on the designer paper and then on white cardstock and cut it out and placed on 3d dots. And now the “involve the guests in crafting” part. 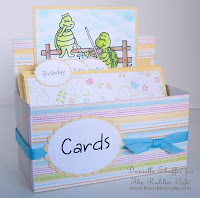 Do you remember the great tutorial of how to make a card file box that Lisa shared with us a couple of weeks back? You find the tutorial HERE. Well, my mum and mother in law saw the box I made and went nuts over it. PERFECT to store our cards, they said. And then we spent a couple of hours together in my scrap room making them boxes too. Here is the result: They did great – didn’t they! With some help anybody can create these simple but beautiful boxes! I won’t be back until next year so I wish you all a Happy New Year! 2 Days until Christmas! Are you ready? I have a few presents to wrap and some food to buy still. I figure once 12 noon on Christmas Eve hits, if you haven't gotten it/remembered you need it, you aren't getting it so no need to worry. Simplify...that's what I'm going for. And, that's exactly what I aimed for with this card. I just love the Magical Ball stamp set and so I've been playing with it a lot. I stamped the image on white cardstock, and then again on green cardstock and cut out the green base and attached it to the white stamped image. Then, I stamped my snowman, masked him off and stamped the globe again. I used my Nestabilities to cut out the circle and then pop-dotted it onto the first image that I stamped. I traced in the insides of my snowman with a blue copic (B000) and then traced him with Crystal Stickles. I went back after and stickled the snow, both on the ground and in the air. Then, I used my Cuttlebug to add some texture to my card front and added the flower for some extra color, once I'd attached all the paper elements. Here's wishing you all a very safe, happy, healthy and Merry Christmas. And, may 2010 be your very best year yet! I was working on fun and games for all the nieces and nephews to play on Christmas day and remembered an older post here. Working in a Christmas theme I made the tic tac board...but wanted something else as there are going to be 10 young kids ranging from age 3 to 15 and a few older. I came up with this fun checker board using the snowman from Magical Ball and the penguin from Winter Fun. I took it over to show Melissa and we played a game. She skunked me...I better work on my checker skill before the kids arrive. I started with a 10" x 10" sheet of paper and added 1 1/4" squares (cut on the Cricut) till my board was complete...32 squares to make 64 checks. I used Cosmo Cricket paper...Breezy Freezy from the Jolly By Golly line. I added a a sheet of blue cardstock 11 x 11" and finally a sheet of white cardstock 12" x 12". I cut shapes using my Cricut and layerd them to make the checkers then added my stamped images. This was a very easy easy project. Don't forget to comment and let us know if you get a chance to make one yourself. Thanks for stopping by and have a great holiday. Christmas is Coming and Valentines TOO ! Today is my day to post ... I am I actually doing it . Lisa has been doing such a great job . She and the design team are really giving it life and putting up some really great stuff . I was thinking today that it feels just like yesterday that we bought the Rubber Cafe and started this company . We are so thankful for all the friends that we have made in the last 16 months and look forward to making more in 2010 . We have so much in store for 2010 brand new products (oh I cant wait for you to see them I am busting to tell ) Dont call me I might let it slip ... Our LONG AWAITED website so it will be easier for shopping ... Blog posts , Technique posts and videos, of course brand new stamps. 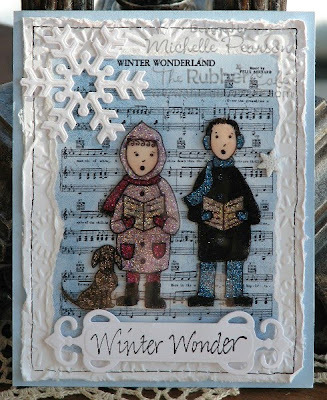 Here today is another CAS, monochromatic holiday card that I made with the most adorable stamps from The Rubber Cafe. For this card I used Tis the Season, Penguin Trio and Elegant Snowflake Border. How adorable are those little guys, and my question is, why do I just assume they are little guys and not little girls. I think it is the whole Tuxedo thing going on that makes them guys.....what do you think? I started by stamping my trio with Memento Tuxedo Black onto cream cardstock and colored with my copics. I stamped both the sentiment and the border in red ink and mounted everything onto red cardstock, added a fun cream and red ribbon and there you go. Simple as can be but oh so cute!!! Hope you like it. I will be back again next Thursday for another card preview!! Happy Wednesday! Only 9 days to go until Christmas! Aaaaagh, there are still cards to be made! LOL! In an effort to have all my cards ready by this weekend (and I'm still a few short! ), I pulled out my new stamps from The Rubber Cafe and got to work. 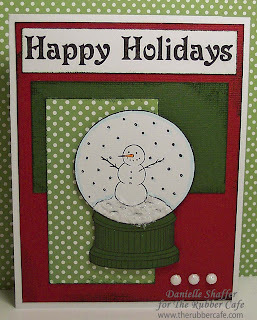 This card features the Magical Ball stamp and Happy Holidays 2. I stamped my snowman first, then stamped him again on scrap and cut him out. I use the scrap to cover my snowman and then stamp my Snow Globe over top. Then, I stamped the Snow Globe again on my dark green cardstock and cut it out and glued it to my original stamped image. Whew! All of this only took me about 3 minutes, so the card was quick and easy. I finished the card off with some Snowflake...very fun glittery stuff! Last year about this time I was in search of an easy project to store my cards for the upcoming year and to give them as gifts. This was a project I was going to use in a class so it needed to be quick to put together. I searched blogs and tutorial all over the web and found project that were using too much paper or took too much time. Finally, I came up with this quick and easy design that used only one sheet of 12" x 12" paper. Instructions for 8 1/2" x 11" sheets also available at the end of this tutorial. · Scor-pal or scoring tool. 3. Fold all of your score lines. Always fold away from your score mark. When you score, the fibers of your paper are broken up to fold that way. 4. Cut into your 3" & 9" margins to the first intersection on the 3" & 6" lines. Do this on both sides. 5. Trim diagonally as shown. This is the top of your box. 6. Add your adhesive to the outside of the middle flaps and the inside of the bottom flaps as shown. 7. Fold the top diagonally cut flap over the outside of the middle flap on each side of your box. 8. Fold the bottom flap over the top and middle flap on both sides to form the bottom of your box. To make your box sturdier, add a little extra cardstock around the inside of your box. This gives it a finished decorative look but also sturdies it up a bit. I hope you've enjoyed this tutorial. Comments are welcome. We’ve been making gingerbread twice this week and I LOVE gingerbread. The taste, how they smell and their cuteness! And guess what, this Gingerbread Background stamp is one of my favorites in this year’s Holliday lne from The Rubber Café! It is a background stamp, but it works also as the main focus for a card. I stamped on kraft cardstock, and colored it with copics, except the white accents which is made with my white signo. I also outlined every thing with my sparkling sakura pen which makes it all shimmer in a really nice way. The sentiment is Season’s Greetings 2. Glittery Winter Fun at The Rubber Cafe! Today I'm sharing some of the fun winter images available at The Rubber Cafe! I've been on a Glitter and Acetate kick lately...and these cards are so pretty in real life! 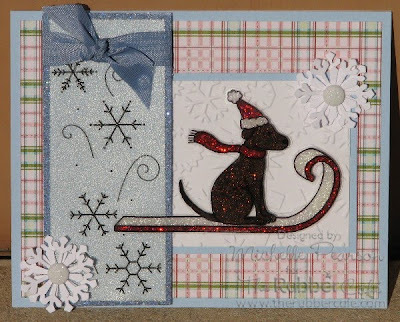 This first card features Elegant Snowflake Border and the Winter Fun Labrador and Kitty Set. This is a great card for the pet-lovers in your life! This card features Twelve Days of Christmas and Stella and Angus. They are all glittered up and ready for the holidays....are you?! 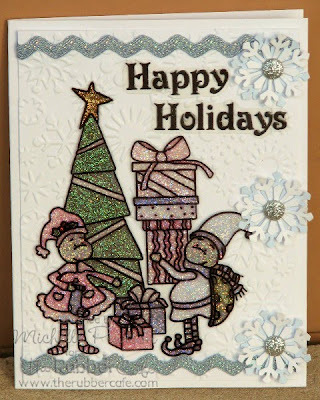 Happy Holidays 2 is embossed on acetate and then cut out for a fun dimensional feel! Lastly, here is a fun card that captures the wonder of the season! The kids in Christmas Cheer are all dressed up in glitter. Winter wonder comes from the Seasons set. I've been lovin' these images....so fun and festive! Clean and simple, no designer paper and I love how this card came out thanks to the awesome holiday stamps from The Rubber Cafe. For today's card I used the stamps Christmas Lights and Happy Holidays 2. Stamped them both in red onto cream cardstock with a red base. Added some red and cream striped ribbon, a button and some linen thread and this is complete. 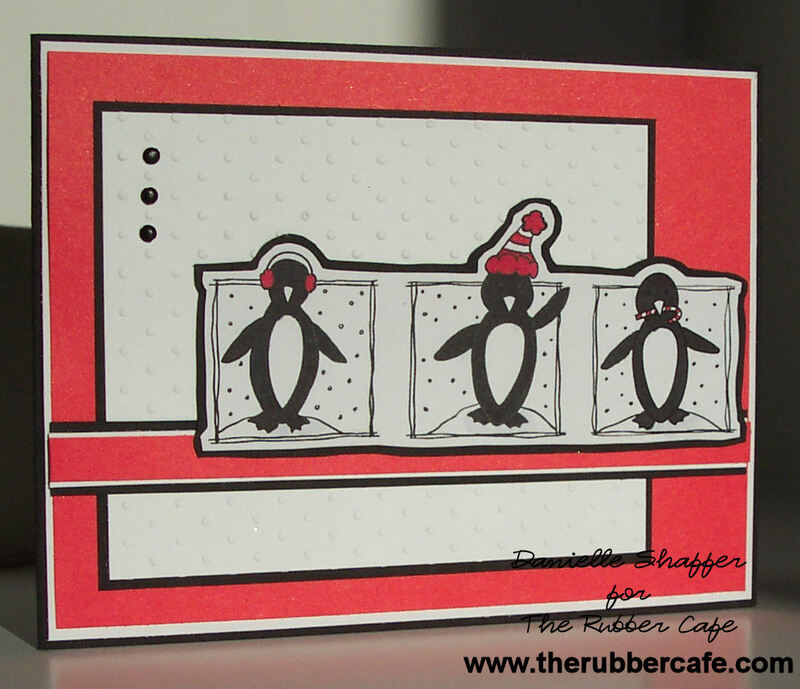 Go on over to The Rubber Cafe and take a look at the new Holiday Stamps. There are tons of goodies. Thanks so much for stopping by today. Have a great one!! I think we're all at the point where we need a few more Christmas cards...at least, that's what I keep telling my hubby so I can go in my scrap room and play! And with this card, I thought I'd try for clean and simple. First, I stamped a sheet of white cardstock with It's A Blizzard Outside and then stamped my sentiment Happy Holidays on blue cardstock. The ink I used was one shade darker than my cardstock, and I used the ink to distress the edges of all of my papers using a sponge. After assembling, I used some stickles on the centers of all my snowflakes, to give the card a little sparkle. This card was so quick and easy that I made a half dozen in a matter of minutes! Nothing like a few quick Holiday cards to get you in the spirit! So...Melissa threw it out there to show off our skills using limited supplies. An elegant dove, Large Brushed Dove carries the sign of Peace Love & Joy to create a simple holiday card. I used an Olive Green ribbon to accentuate the Versa Fine Olympia Green ink and Pistachio background paper. Two small Olive gems seporate each word. All together I used ink, stamps, paper ribbon and gems. Thanks for stopping by and have a great weekend. Oh Christmas Tree...♪ ♫. Ok...enough of the Christmas carols...now that song will be in my head till I hear another one. The Large Burlap Tree and the Small Burlap Tree stamps felt a little bare to me...so...off I went to find something to spruce them up. 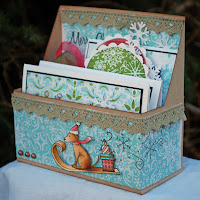 A little vintage paper from Graphic 45 paper "Glad Tidings", and some frosted gems is just what these stamps needed. First I inked with Memento inks...the tree with Cottage Ivy and the burlap with Rich Cocoa, then stamped and colored with copics #E11, E33, E35. I added a little shadow at the bottom with some warm grey #W1, #W3. Smudged the edges with just a tiny hair of Memento Potters Clay to vintage it out a little. Everything is matted in a beautiful red cardstock. The Small Burlap Tree popped is up for some extra dimension. Hi Everyone!! 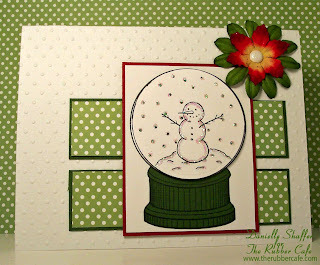 My card today was made from two new stamps from The Rubber Cafe called Tis The Season and Its a Blizzard Outside. I wanted to keep the card CAS and monochromatic in color so I decided to go with some plum colors. I know this picture looks alittle brownish but my cardstock is all in the plum family and my ink is plum too. I started by stamping my Its a Blizzard Outside onto white cardstock and cut it out in a festive shape. I added some white ribbon, some gorgeous sparkly snowflakes and these fun little baubles in a purple hue. Thanks so much for stopping by today to take a peek. 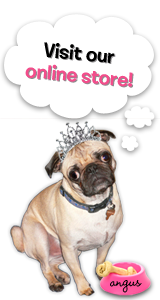 Keep stopping by because everyday each of the DT will be posting a new creation for you to take a look at. Let me introduce you to the Penguin Trio! Aren't they just the cutest little guys? And such a fun and easy stamp to use...you can use them all together or cut them out use them seperately. I chose to go with a red, white and black theme for this card...not exactly Christmas, but neither are penguins. There is definitely more than one person I know that I could give this card to for "the holidays" rather than for Christmas, if you know what I mean! After I stamed the image, I coloured it in with my copic markers, and then used Monday Mojo Sketch 108 for my layout. And, since the layout didn't have a place for a sentiment, and I had a hard time figuring out where to fit one in, I stamped out Merry Christmas (Simple) and copied the layout for the inside of my card. Although I don't always do it, I do love how it gives the card a polished look. I hope that you are almost ready for Christmas...only 23 days to go!